Yesterday I felt really frumpy. I tried to look cute in the outfit I chose for the day job, but I looked anything but cute. I had a little short-sleeved top, a soft, cropped cardigan, and some Lee pants. Doesn’t sound so bad, right? Wrong. Because there was the very unfortunate combination of colors. The pants were light, sandy brown, the top was orange, and the sweater was olive green. That’s right, I was dressed like a house out of the ’70s. 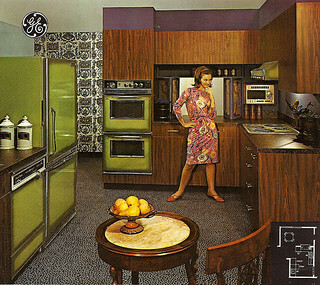 My top was the color of the cabinets and my sweater was the color of the appliances. My pants were the color of that tiny strip of border above the window. 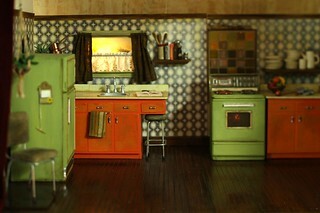 I was a ’70s kitchen. I was self-conscious all day and tried not to leave my desk unless it was absolutely necessary so as few people as possible would see me. Although I was wearing the color scheme of this dreadful livingroom, I’m grateful my hair didn’t look like shag carpeting. The more the day dragged on the more stupid I felt in my weird ensemble. I’ll never use that combination of clothes again. When I got home I quickly changed into a pair of sweat pants and a denim work shirt and thought I would have looked better wearing that to work. Burnt orange and avocado green. Take my advice and don’t do it, unless you’re able to spend the day hiding from view of the general public. I would have looked better had I been wearing this woman’s outfit. Except I would never stand with my legs apart like that. That one looks kind of broken. Today I’m wearing a black skirt and a black blouse. I like the svelte look. Much better than looking like a big, green refrigerator. I know. Oh, I know. Thanks for your kind sympathies, and for not laughing too hard. To my face, that is. This is hilarious! 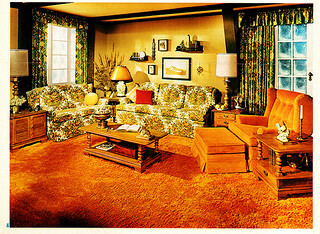 But, if you ever find yourself in that position again, think to yourself, “Sage….Saffron…Poppy…”; those are the new names decorator’s have given to those seventies colors, so they could sell them again. It really does make them sound more attractive! Thanks, Sara! Sage, saffron and poppy do sound more attractive. We all know the truth, though. Those garish, clashing colors say nothing but “dork” to me. At least when I wear them. Thanks for your reassuring words, though. I can count on you to always make me feel a little better about the blunders I make. Hey, I never thought of that! Thanks for looking on the bright side for me!